Tomorrow I turn 48. Yes, I’m a Halloween baby and yes, I’ve just realized that getting old is kind of scary. It seems the older I get, the more frightened I become. Even daily chores that used to be routine and mundane now fill me with anxiety. For example, getting my blood work done at the doctor’s is kind of scary and those teenagers at the mall look very menacing. I used to drive fast, but now I have started driving more in the right lane. Before too long, I’ll buy a fedora… and a Buick. That’s what old people do, right? We had a very productive MMMMM (Madison+Main Monday Morning Meeting) and I put the finishing touches on my latest keynote presentation, Bold Brands Win. I have been invited to speak at a lot of business organizations in the past few months, such as Kiwanis Clubs, Rotary Clubs and various business associations. These days, technology moves at such high speeds, I find myself having to update the data every few weeks. In November I already have four speaking engagements lined up, including a keynote for the Virginia Society of Association Executives at the Jepson Alumni Center. If you’d like to see me live and have a very nice plate of banquet chicken, click here. The following week I’ll be in Washington, DC presenting to PBS and PBS Kids (I waived my fee for PBS since they’re in the middle of a fund drive). On Tuesday morning Madison+Main was featured in Richmond BizSense for several news items, including Renita Wade joining our team as Art Director, the new TV spot we created for CowanGates and Swift Creek Mill Theatre choosing us as their agency. See the story here. Wednesday, October 28th – On Wednesday morning I conducted a social media marketing training for a client, and then returned to the corner of 1st and Cary for a marathon series of creative concept sessions. Creative minds need feeding, so I bought lunch for everyone from Zoe’s Kitchen, and I must say I was very pleased with everything, and so were the Madison+Main-iacs. I think we may have found our favorite new takeout place. On Wednesday we launched our latest — and maybe our greatest — TV spot to date. The Yard Works“Weekend Warrior” returns in our 3rd installment, entitled “Princess.” Special thanks to Barry Ellenberger who reprises his role as The Weekend Warrior, Broadscope Media for their awesome production work and Addison aka: Princess who came to us from Liquid Talent. It was a great team effort and I hope you enjoy it. Thursday, October 29th – On Thursday morning, I attended the Building on Success Breakfastcelebrating the past year’s accomplishments of Communities In Schools – Chesterfield. The breakfast was held at the all-new Chesterfield Technical Center (the old Clover Hill High School). The most inspiring moment of the morning was learning the story of Lester Reed, the inaugural winner of the Martha Frickert Scholarship. Martha was the long time director of CIS and the organization announced the scholarship in her honor yesterday. The first winner was Lester, who was born with deaf parents and learned sign language before he learned how to read. Lester was mentored through CIS and graduated from Community High School and now is studying to become an interpreter for the deaf. 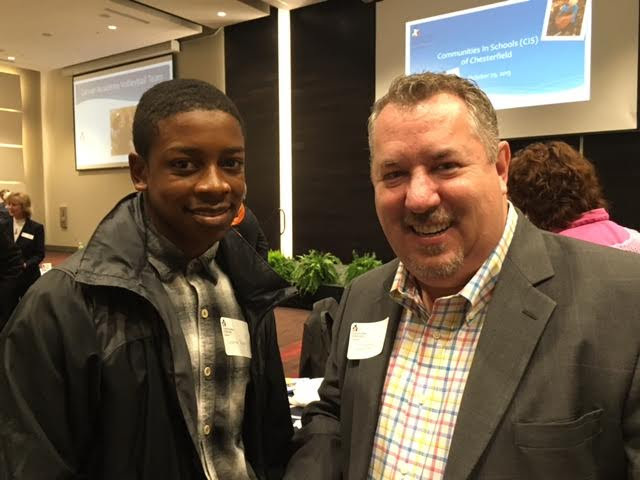 Meet Lester Reed, 2015 winner of the Martha Frickert Scholarship, and my new friend. On Thursday night, this proud Papa stopped by Manchester High School to see my daughter, Hattie, perform with the combined choirs. She is a senior and will be off to college soon, which is also making me feel old this week. Friday, October 30th – At Madison+Main we go all out for Halloween and today is a triple witching day with a full moon. The staff is celebrating the holiday in costume, which makes for some very odd conversations in the stairwell or at the water cooler. On Fridays teammates bring in their pups, so Kaitlin put her dog, Rocco, in costume. And I, with the assistance of the multi-talented Abby Spence, collected items this week so I could dress as a disgraced former Subway spokesperson. Careful, eating a diet that solely consists of Sweet Onion Glazed Teriyaki subs could turn anyone into a monster. 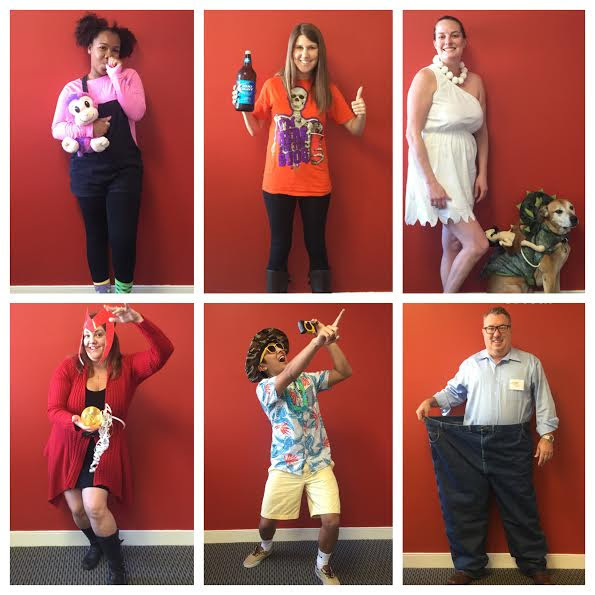 The Madison+Main-iacs getting into the spirit for Halloween.